We bought a little piece of land that adjoins our property down by the garden. I think it will be a great place to plant blueberries, apple and peach trees. It gets more sun than most of our space, so plants will enjoy that. The lady has kept it well maintained, and it looks like a lawn. Of course, this means that I'll have to spend more time cutting grass, but that's OK with me. Some people get creative bursts when they're in the shower or other places, but my mind wanders when I cut grass. It's not a chore. We signed papers this afternoon and this evening I walked around getting a feel for the lay of the land. It was blissful. On another note, I spoke during lunch for the Walker County Genealogy Society. The original speaker had a conflict and couldn't make it, so they asked me to fill in. I talked about the story I did a while back about the Piano Memorial at the college. It's a fascinating story that almost didn't get written, but the cards fell into place and it turned out well. It's the one the American Legion Online Magazine posted late last year. Beautiful, Rick .....everything looks so green and lush. Congrats! I remembered the story, whether in the book or on your blog, but it was nice to re-read it. Especially after thinking of Doolittle and his flight. I can imagine how proud you and Jilda must be of the new property. Sounds great. There are jobs like mowing, that allow me to think, roofing is one, repetitive jobs can allow the mind to soar. Congratulation on your new acquisition. You can't go wrong with more land. Good luck with your gardening. I think it's great. Congratulations on the new piece of land. You have such a great view from the porch there. 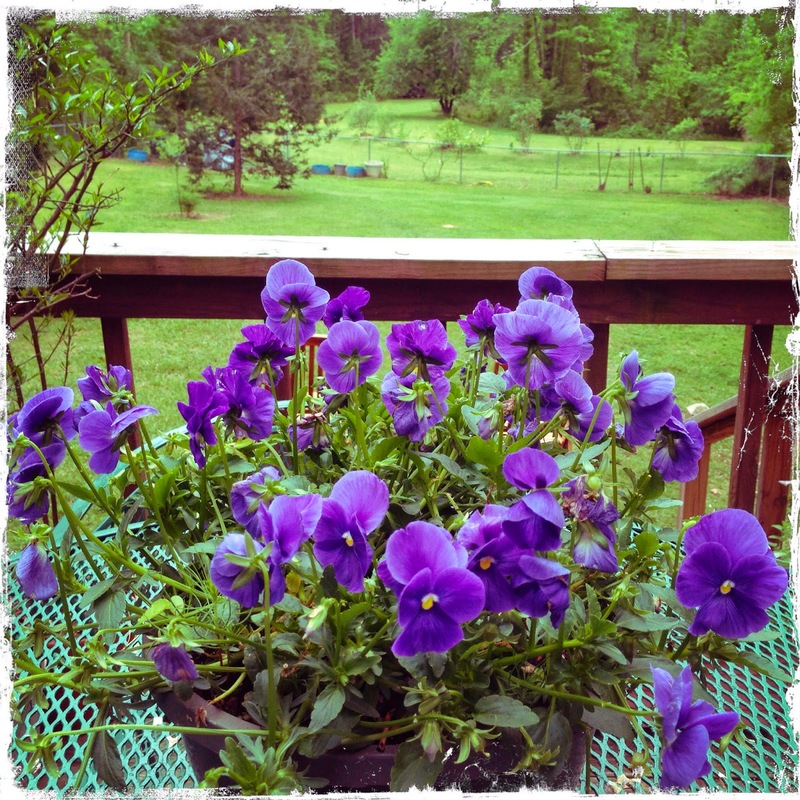 The pansies are delightful. I remember that story! I love WWII stories about our heros back then...the greatest generation. I'm glad you could share that with that group, I'm sure they enjoyed it. Congrats on your new piece of heaven on earth! I love to mow! I call myself a "mow ho"...oops, maybe that's not a good blog worthy sentence! Enjoy the weekend! The fruit trees will be wonderful as will the blueberries. My mother used to make apple butter or the equivalent from many fruits. She said it was easier than canning which she also did. I used to do freelance illustrations for American Legion Magazine, the print version. Your plans for the new land-purchase are terrific --exciting projects because there's calmness in horticulture. I'd have never lasted in another profession.